(Nov. 6, 2018) – It will be a heroes’ welcome when UTSA Football returns home this Saturday, Nov. 10 for a Conference USA showdown with Florida International University. 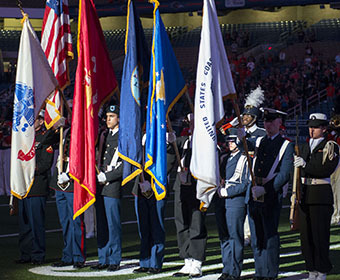 Throughout the game, set to kickoff at 6 p.m., UTSA will honor military veterans, first responders, teachers and other community heroes on the field and the video boards. Fans also will be treated to an ROTC Joint Honor Guard and special halftime show. >> Discovery why UTSA is Military Campus USA. Before Roadrunners #DefendTheDome, they have many more ways to show their school spirit this week with fun-filled activities. Tuesday, 7 p.m., Walk-On’s Bistreaux and Bar at Huebner Oaks, 11075 IH-10 West, San Antonio. Fans are invited to join Coach Wilson and host Andy Everett for the one-hour radio show one day earlier this week. There will be a chance for attendees to win prizes and giveaways. Fans also can call in at 210-736-9760 and listen on Ticket 760 AM and Ticket760.com. Join the Rowdy Crew and members of the UTSA Football team for entertainment, food and fun to get hyped for this weekend’s game. The 30-minute television program will air on AT&T SportsNet each Friday throughout the football season. Air times vary so check channel listings. In San Antonio, the program will air at 10:30 a.m. each Saturday on KMYS-CW 35. Full episodes also will be available on the UTSA Athletics website after the program airs on TV. All military affiliated Roadrunners and their families are invited to this tailgate hosted by the UTSA Veteran and Military Affairs. Food and non-alcoholic drinks will be provided. Roadrunner fans of all ages can take part in free pregame festivities including food, games and music. Rowdy Town is open three hours before each home game. The UTSA Alumni Association invites fans to the official Roadrunner Nation tailgate, three hours before game time at its new location. There will be food, music, a live watch party and more. For more information, visit the UTSA Alumni Association website. This is an exciting tradition for fans to get the team pumped for the game. Join the Spirit of San Antonio and UTSA Spirit squads as they lead the team down Roadrunner Alley and into the Alamodome two hours before each home game. Fans can line the walkway between the Alamodome parking lots B and C, cheering and showing the team they’re behind them 100 percent. Fans can look for orange smoke in this area to know when it’s time for the Spirit Walk. All UTSA games offer free admission for UTSA students. Students may also purchase up to four guest tickets at $10 each. Get ticket information. Fans should be aware of the Alamodome clear bag policy including a list of the approved bags. Parking at the Alamodome is limited to fans with a season pass, but there are many other places to park or get to the game. VIA is providing shuttle services for all 2018 UTSA football home games. UTSA students may purchase tokens at a student rate of $1.25 each way and fares for the public will cost $5 round trip. Service conveniently begins two-and-a-half hours before kickoff. The last returning bus departs from the Alamodome 45 minutes after the official end of the game. The Main Campus shuttle departs from Laurel Village at the corner of Brenan Ave. and Tobin Ave. The VIA Token Trailer will also be set up north of the Laurel Village Office for purchase. Special event tokens may also be purchased ahead of time at Roadrunner Express in the Main Campus Student Union, using VIA’s goMobile app and at all VIA Information Centers. Other VIA Park & Ride services include Crossroads Park and Ride at 151 Crossroads Blvd. and Madla Transit Center at 1584 Cantrell Dr. beginning at 3:30 p.m. on game days. In addition to Park & Ride, VIA Primo (100) and VIVA centro (301) will be detoured to serve the Robert Thompson Transit Center at the Alamodome, beginning at 3:30 p.m. and continuing for one hour after the conclusion of the game. Fare is $1.30 ($.65 for students) each way. Students can park in any unmarked spaces on Saturdays at the Downtown Campus in Lots D-3 and D-4 under IH-35 and walk to the game. It’s about a two mile walk to the Dome, so comfy shoes are advised. Students parking at the Downtown Campus also can catch the VIA Alamodome Express service on Buena Vista St., near UTSA Lot D-1. Look for VIA’s temporary bus stop signage and VIA personnel. The drop-off and pick-up location for rideshare users is located in the parking lot next to the Henry B. Gonzalez Convention Center at the corner of Montana Street and Tower of Americas Way. Uber is the official rideshare partner of UTSA Athletics. Use promo code UTSAHEROES and receive $10 off a ride that ends or starts at the Alamodome on game days. Doors will open to the public at 4:30 p.m. Fans are encouraged to be in their seats for the pregame festivities on the field featuring the Spirit of San Antonio Marching Band beginning at approximately 5:45 p.m. The Alamodome is introducing countdown to kickoff alerts in the parking lots in the hour leading up to game. The security team will visit the parking lots to sound an air horn at one hour, 30 minutes and 15 minutes prior to kickoff to help remind fans to begin heading to the Alamodome. Get into game mode by brushing up on UTSA game traditions and other important information. Stay engaged with fellow Roadrunners by sharing your UTSA Game Day experiences on social media using #UTSA, #BirdsUp, #GoRunners and #DefendTheDome. Also, follow UTSA Football and UTSA Athletics on Twitter. Can’t make it? Watch or listen live! Saturday’s game will be televised on ESPN+. It can also be heard on 92.5/93.3 The Bull in San Antonio and live online at goUTSA.com and The Bull via the iHeartRadio app. The pregame shows begins at 4 p.m. and there will be a 45-minute postgame show. During the football season, the Monument lights and Student Union Tower lights will glow blue and orange during home game weeks. After a win, the lights turn orange in celebration for the rest of the weekend. Experience UTSA Football Game Day. Meet the Roadrunners Football team.